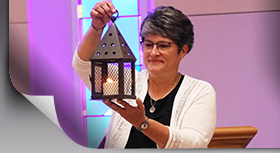 On Monday, November 12, the Sisters of the Presentation hosted “Passing on the Lantern Light,” an event honoring the 300th anniversary of the birth of Nano Nagle. The event recognized 10 organizations who bring light to women, children and immigrants in the Dubuque community with an honorary gift of $3,000. “This gift is our way of partnering with other local organizations in their work of offering hospitality to those who struggle to live in dignity and security and in honoring Nano’s legacy as, together, we all work to brighten the lives of others,” states Sister Joy Peterson. Teresa Shelter, a safe place for all women and children who find themselves homeless due to circumstances beyond their control, was initiated by Dubuque area Catholic sisters in 1997. The library is right across the street from the shelter so it was a perfect fit. The event was a huge success and the support was appreciated by all recipients. Below are a couple of the organizations’ expression of gratitude. Today Nano’s story is being shared and lived out by countless women and men throughout the world who have been captured by Nano’s vision, her passion and her commitment to education, to the care of the vulnerable and powerless and to the transformation of unjust systems. Nano would be so proud.